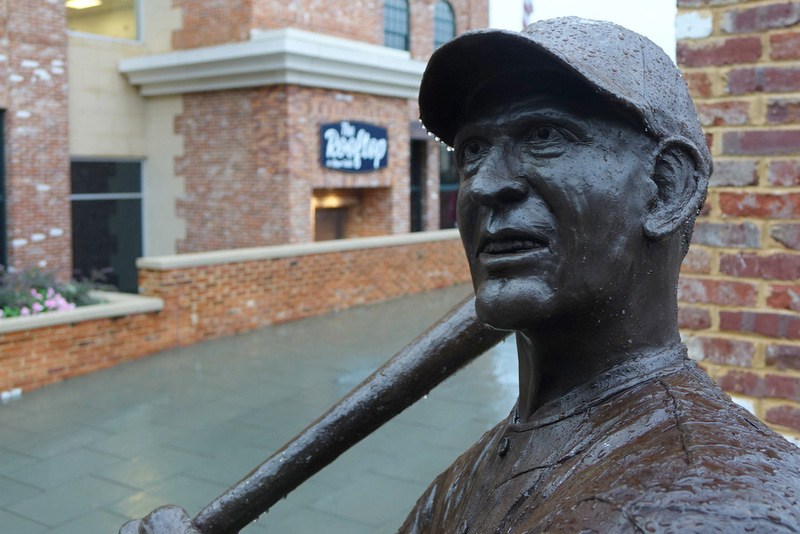 The Shoeless Joe Jackson statue endures rain, as the entrenched wet weather system rained out another baseball game at Fluor Field. 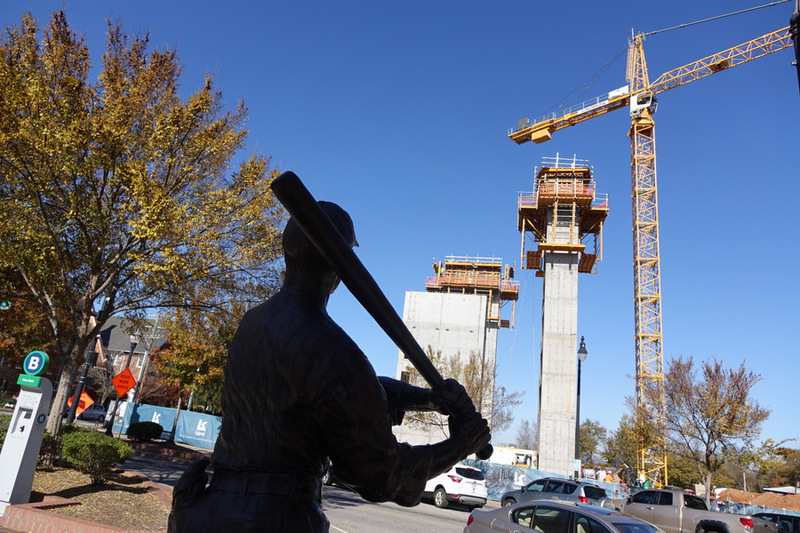 The new Homewood Suites under construction are within the range of a virtual ‘homer’ by Shoeless Joe Jackson’s statue. 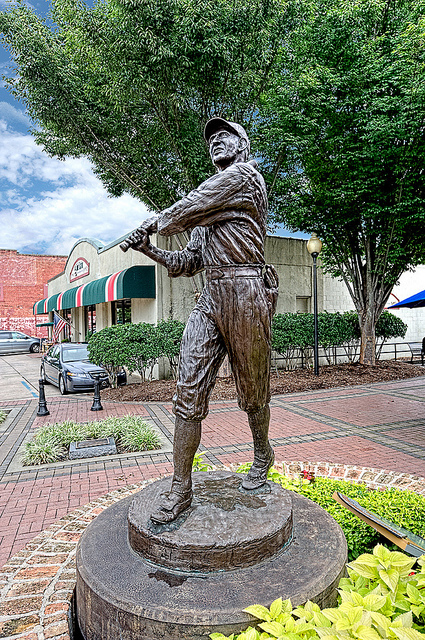 The Shoeless Joe Jackson statue at the corner of Main Street and Augusta Street. First shots with the Nikon D3s, single shot HDR. Even Shoeless Joe is getting the Christmas spirit by wearing a Santa hat. The annual vintage baseball game between the Greenville “Shoeless Joes” and the Ty Cobb “Georgia Peaches” was held this year in Greenville’s Shoeless Joe Jackson park. The game is played according 1860’s rules, including no gloves, no cleats, and no helmets. With catches on first bounce counting as outs and no walks, the emphasis of these vintage games is on hitting, base-running, and defense. Rules are enforced by this “Judge” who entertained the crowd with his banter. Games in this park are played in the shadow of Brandon Mill, where Shoeless Joe Jackson worked as he grew up. The “Shoeless Joe” Jackson statue starting to collect snowflakes during last week’s snowfall. 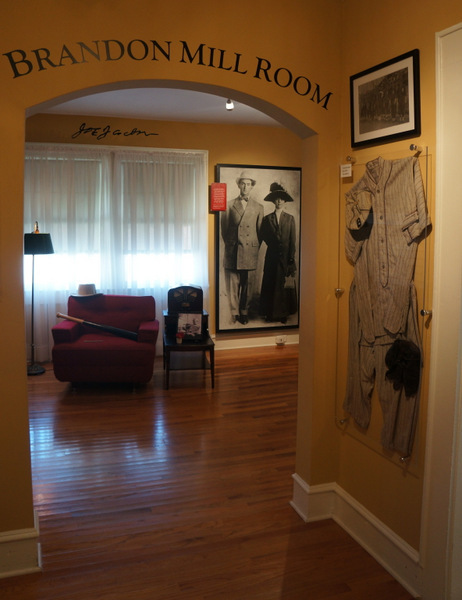 I’m guessing that the real Shoeless Joe wore shoes when playing baseball in the winter. 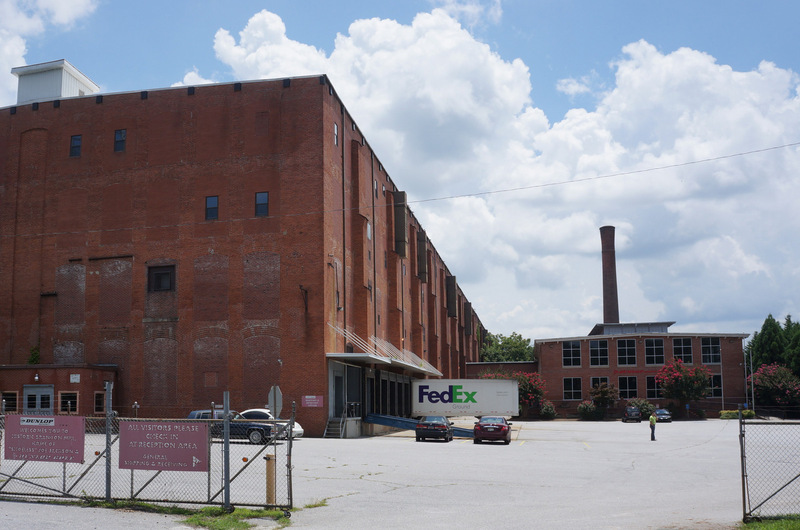 Brandon Mill is the community where “Shoeless Joe Jackson” was born, and started his career in the baseball field near the mill. 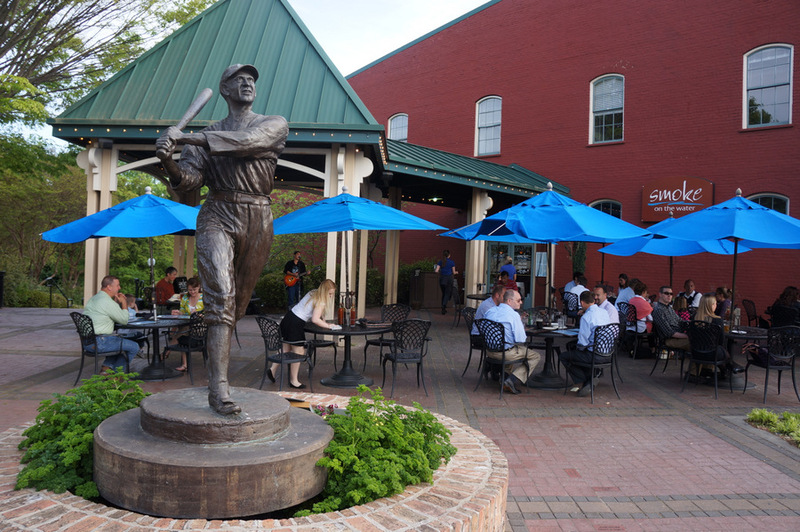 The statue of Shoeless Joe Jackson in the Shoeless Joe Jackson Plaza in front of Smoke on the Water restaurant. 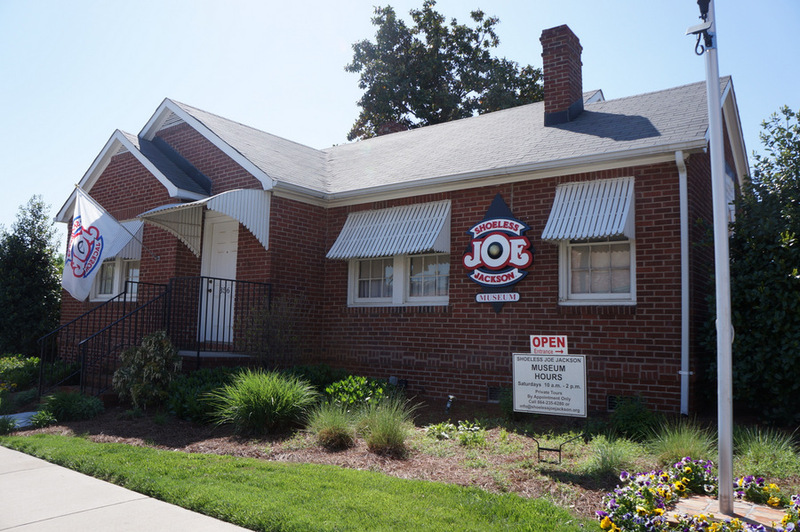 TheÂ Shoeless Joe Jackson Museum in the West End across from Fluor Field is worth a visit to learn about one of our most famous baseball players in the past. Â It has free admission during its Saturday hours of 10:00-2:00. Â Be sure to keep an eye out for the black and white panorama photo, created long before cameras had a built-in panorama photo mode. Â Ask about the prankster appearing in the panorama photo as well! Summer arrives in Greenville at 7:09 this evening, and the summer flowers in the Shoeless Joe Jackson Plaza are at their finest. Â In the background, customers atÂ Smoke on the Water enjoy outdoor dining at the plaza.